The working members of the batch-combined machine for minimum tillage and crop tending are combined into two separate batches. By means of the first batch, there are performed simultaneously tilling and sowing operations, but the second is intended for surface tillage and crop tending. During just one field day, the machine is capable of performing 8…10 agricultural operations, and its working members can work in three modes: 1. Soil loosening without furrow slice overturning, when the main tillage unit (wedge) is in its working condition together with lateral knives (for the eroded soils); 2. Clod furrow slice pulverization and mixing, when the main tillage unit (wedge), lateral knives and rotary tiller are in their working conditions (for the non-eroded soils); 3.Cultivation of humid soils with a partial overturning of furrow slice, when the main tillage unit (wedge), lateral knives and rotary plough (instead of tiller) are in their working conditions. The cost of oil and lubricants and operating time are reduced by 2…2,5 times, and besides, the agrotechnical terms reduce considerably. The design formula for tillage output envisages both broken and unbroken soil strips. This formula can be also used for calculation of the machine output during cultivation, sowing, cutting the irrigation channels and so on. The proposed batch-combined machine can be also considered as energy-saving, resource-saving, environmental and advanced technology. The argument of this paper is rotary the tiller blade, which undergoes severe surface wear during tillage of agricultural land. 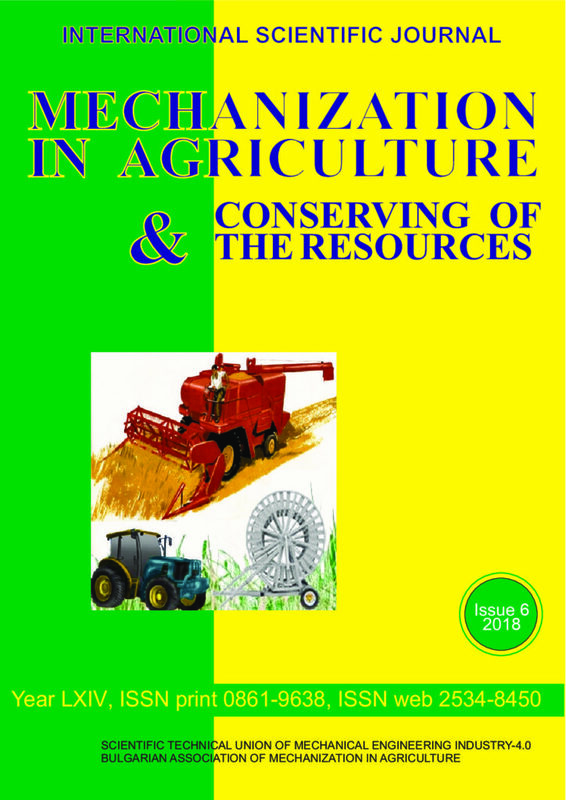 The study was conducted by comparing on H-shaped blades, of two different manufacturers, used in rotary tillers, mainly in the fields of Myzeqe, Lushnje. Our tests included the measurement of the abrasive wearing as weight loss of material of each blade to the end of lifecycle – recorded after every 10 hectares cultivated surface in field conditions. We experimented in laboratory the blade wearing through ‘pin on disk’ test. Another tribological parameter measured in the laboratory was the hardness in Vickers on cutting edge of the blade, before and after wearing. To make the targeted optimization, we initially computed a stressed situation on the blade cutting edge, and then processed through the SOLIDWORKS software, which generates a map of more stressed areas that lead to significant wear. By simulating with geometric parameters of tiller blades, we have sought the situation of stresses with less impact on wearing of tiller blades. This paper is also includes relevant recommendations.